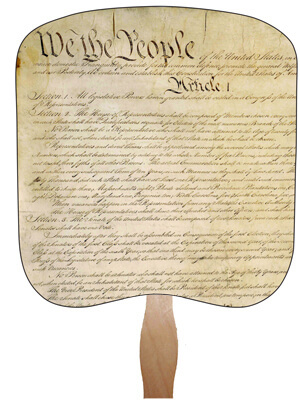 This political or campaign hand fan includes the stock design shown above. Cost includes 1 color print on the back. Custom text on front will cost extra. Imprint Area 7.5" Max Width X 8" Max Height. Please leave 1/4" bleed room. Sizes are approximate. I got home and the fan are there and they are wonderful. They are going to be a great hit at the Barry County Fair this weekend and next week . The barns with the animals and Grand Stand get really hot there. Thank you Thank you Thank you, I will remember your business in 2016 and spread the work how you rushed them to me and made your deadline. Thanks God Bless you and you will here form me again. Our Political Fans were Awesome! I called to thank you, but decided to post a note here to let others know what a great job you did on our political hand fans. The colors were so vibrant and exceeded our expectations. We are going to be proud to give these out at our campaign! Thank you for the awesome fans! And to top it off, they arrived 1 day earlier than promised.